Many owners of summer cottages choose wooden floors when building houses. This is due to the fact that wood is an environmentally friendly material that has aesthetic appeal and natural naturalness. In most cases, the construction of a wooden floor requires a lag - wooden beams, stacked on the main floor. When installing it is very important to choose the right distance between the floor lags. creating an even and solid base for installation of the finishing flooring. Calculation scheme distance between lags. 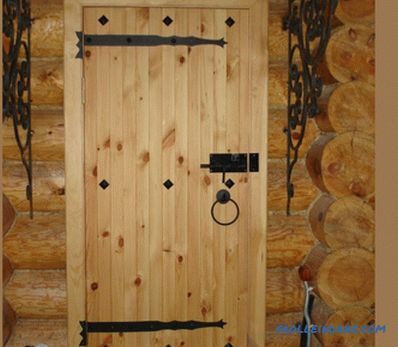 In most cases, logs are made from wooden beams of coniferous and hardwood. Sometimes metal, reinforced concrete and polymer analogues are installed, but it is not economically viable. In the absence of a wooden bar, logs can be constructed from several planks knocked together. In this case, they fit on the edges. 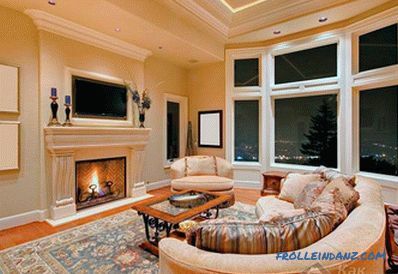 Choose inexpensive wood (fir, pine or spruce). If the room in which the floor is mounted will have a higher humidity (for example, a sauna), then hardwood should be used. 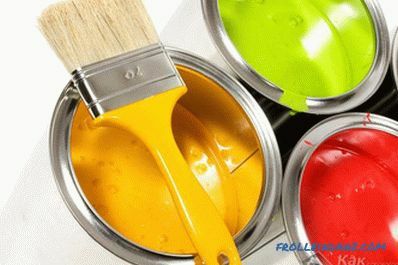 To save the budget, you can choose building materials of 2 or 3 grades with a humidity of 17-22%. Beams must have a rectangular section of a certain size. 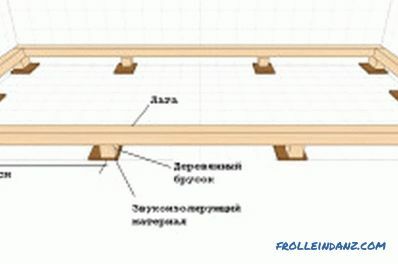 The dimensions of the timber should be chosen based on the span, that is, from the distance between the beams of the lower junction. How to choose the right lag section? 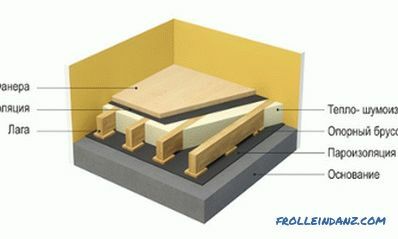 Layout of installation of the subfloor on logs. 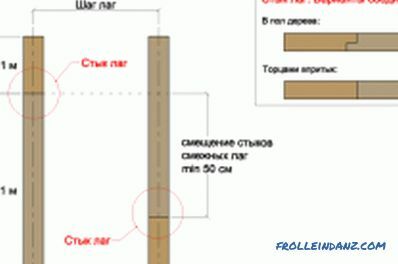 The beam section for making a lag is determined by 2 factors: the length of the span between the support points (columns, pads or transverse beams) and the maximum load under which the floor will be when it is used (for residential premises it is not more than 300 kg / m 2 ). The section of the beams should be rectangular in shape, a multiple of 1.5, and a height of 2, that is, the aspect ratio in the section should be 1.5x2. When laying beams, the large side should be vertical. This will allow to achieve the maximum rigidity of the structure with minimum wood volumes and, accordingly, minimum costs. Table 1 shows the dependence of the beam cross section on the size of the span. Also, the beam section will depend on the thickness and strength of the floor covering. When installing the floor should pay attention to the layer of insulating material. 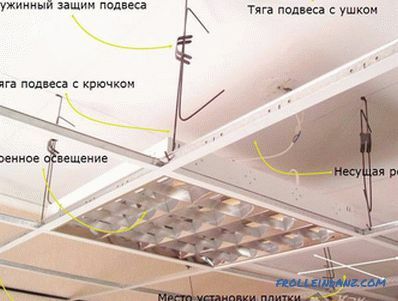 There should be a small gap between the finished ceiling and the insulation between the lags, for natural ventilation of air at least 2 mm wide. This means that the bar must be purchased taking into account the size of the ventilation gap. To construct a wooden floor over logs, it is recommended to use a bar with a small margin of section. 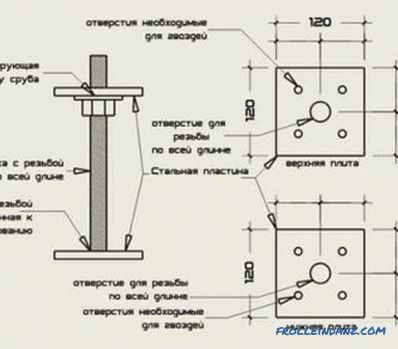 Beams can be mounted either on a concrete base or directly on the ground. The differences in these methods of laying are in supports that will be used under the bars. If the foundation is ground, then concrete or brick columns, which are installed every 1.2 m, should be used as supporting elements. These elements are made of red brick M100. The use of column supports allows you to save on the thickness of the wood. So, with a lag length of 400 cm, only one support, installed in the middle, will allow you to reduce the cross section from 180x100 to 110x60, which ultimately significantly displays on your budget. The distance between the lags (step) is a very important parameter, based on which calculations are made for the required amount of building material. When thick boards with good strength are used as a finishing slab, beams can be installed relatively rarely. 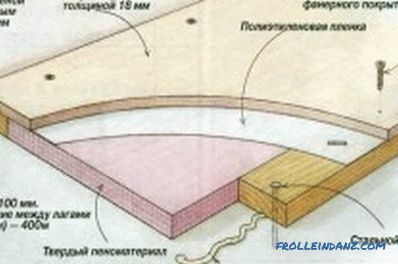 If the flooring is carried out by thin elements, then the step should be reduced. Table 2 shows the dependence of the distance between the lags on the thickness of the finish coating. The data in Table 2 is approximate. For a more accurate calculation of the pitch, you can give an example when you need to know what the distance should be between the beams when designing the floor in a room 9 meters long. This uses a beam with a cross section of 180x100 mm, and 30 mm thick boards are used as the finishing coating. 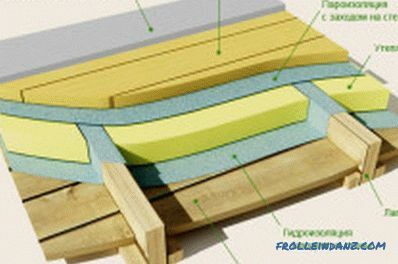 Layout of plywood on logs. 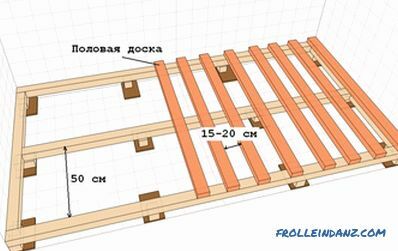 Since the thickness of the board is 30 mm, according to Table 2, the pitch should be 0.5 m. The total number of beams will be indicated by k. Consequently, the width of all the lag will be equal to 100 * k (mm). The first bars will be laid at a distance of 30 mm from the wall. On this basis, the step between them is equal to k-1, and the distance between all elements is 0.5 * (k-1). To find the step between the beams, you need to create an equation: the length of the room = the width of the beam + the distance between all the logs + the distance from the walls. The result is: 9 m = 100 mm * k + 0.5 * (k-1) m + 30 mm * 2. Having resulted all values ​​in uniform system of calculation, receive: 9 = 0,1 * k + 0. 5 * (k-1) + 0,03 * 2. The number of beams must be integer, so the resulting value should be rounded up. That is, to construct the floor you need to prepare 16 lag. The sum of all the gaps between the lags will be: 9 - 0.06 - 16 * 0.1 = 7.34 m. Dividing this value by the number of gaps, you will get: 7.34 / 15 = 0.489 m. For the given example, you need to set the lags through every 0.489 m or 48.9 cm. 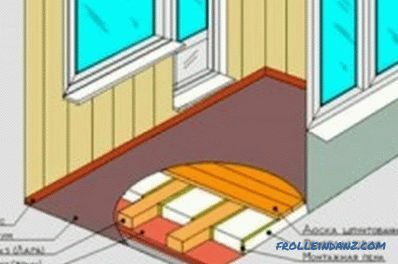 Floor insulation scheme with lags. The base on which you intend to mount the floor must be thoroughly cleaned of debris and treated with a deep penetration primer. All wooden elements should be treated with an antiseptic, with which you can increase the service life of a wooden structure. Beams should be laid along the window with gaps between the walls of 3-4 cm. After installation, the lag surface is checked for horizontal evenness with a long level. If there are no gaps between the level and the beams, then all the work is done correctly. The reliability of the whole structure depends on the lag section and the step between them. Therefore, the choice of these parameters should be taken seriously. What affects the shrinkage of the log house? Shrinkage of a log: factors that affect it. Preventive measures and work during the shrinkage process. Tools and materials needed for work.